“Our students are changing, and we need to change with them,” said Vice President for Academic Affairs Ron Pitt in his welcome remarks at RIC’s annual Adjunct Professional Development Day on July 15. Some 49 adjunct faculty members attended the Faculty Center for Teaching and Learning (FCTL) event, organized around the theme, “Alternatives to Lecture and Discussion.” Highlights from the six workshops included introducing collaborative learning concepts, incorporating autobiography in the classroom and using digital storytelling to help synthesize learning. 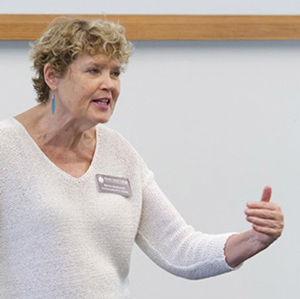 Bonnie MacDonald, FCTL’s director, shared with adjunct faculty members that the “really important thing [about the event] is the opportunity to talk with each other,” in order to find common ground and learn from each other. “We couldn’t manage without adjuncts,” said MacDonald, adding that RIC greatly values their commitment to teaching. Marie F. Beardwood, an academic technologist for FCTL and adjunct faculty member in two departments on campus, led the workshop, “Strategies for the Successful Use of YouTube in Face-to-Face and Online Classes.” Since joining RIC in 2011, Beardwood has been instrumental in helping her peers change the way they teach classes. Beardwood said that, for her, student engagement in her classes is enhanced when she combines digital and human interactions. When she includes compelling YouTube videos into her online lessons, students do more work before the start of class, allowing her to “delve so much deeper” into the subject matter. This story was originally published by Rhode Island College News. Reprinted with permission. This entry was posted in professional development and tagged . digital literacy, adjunct faculty, curriculum integration, distance learning, hybrid learning on July 29, 2015 by c4tuna.